1. (1) The definition of “information technology” in subrule 1.03 (1) of Regulation 194 of the Revised Regulations of Ontario, 1990 is revoked. (2) Subrule 1.03 (2) of the Regulation is revoked. (3) A document mentioned in rule 4.05.1 is sufficient, despite subrule (1), if it meets the standards of the software authorized by the Ministry of the Attorney General. 3. Subrules 4.04 (2) and (3) of the Regulation are revoked. (1.1) A document mentioned in rule 4.05.1 may be issued electronically by using the authorized software. (1.2) A document issued under subrule (1.1) shall be deemed to have been issued by the Superior Court of Justice. 1. All documents required to be filed in a proceeding shall be filed in the court office in which the proceeding was commenced, subject to paragraphs 2 and 3. 2. If the proceeding has been transferred to another county in accordance with rule 13.1.02, the documents shall be filed in the court office in the new county, subject to paragraph 3. 3. An affidavit, transcript, record or factum to be used at a hearing shall be filed in the court office in the county where the hearing is to be held. (4.1) A document mentioned in rule 4.05.1 may be filed electronically by using the authorized software. 5. (1) Subrule 4.05.1 (1) of the Regulation is revoked. (2) Paragraph 7 of subrule 4.05.1 (2) of the Regulation is amended by striking out “subrule 60.15 (2.1)” and substituting “subrule 60.15 (4)”. (3) Paragraph 4 of subrule 4.05.1 (3) of the Regulation is amended by striking out “subrule 60.15 (2.1)” and substituting “subrule 60.15 (4)”. 6. Rule 4.05.2 of the Regulation is revoked. (h) acknowledges that he or she has been informed of his or her liability to pay personally any costs awarded against him or her or against the person under disability. (2.2) A person who has authority under subrule (2.1) to act as litigation guardian shall, before acting in that capacity in a proceeding, file an affidavit containing the information referred to in subrule (10). 9. Rule 11.01 of the Regulation is amended by striking out “the proceeding shall be stayed” and substituting “the proceeding shall be stayed with respect to the party whose interest or liability has been transferred or transmitted”. 13.1.01 (1) If a statute or rule requires a proceeding to be commenced, brought, tried or heard in a particular county, the proceeding shall be commenced at a court office in that county and the county shall be named in the originating process. (2) If subrule (1) does not apply, the proceeding may be commenced at any court office in any county named in the originating process. 13.1.02 (1) If subrule 13.1.01 (1) applies to a proceeding but a plaintiff or applicant commences it in another place, the court may, on its own initiative or on any party’s motion, order that the proceeding be transferred to the county where it should have been commenced. (ix) any other relevant matter. (3) If an order has previously been made under subrule (2), any party may make a further motion, and in that case subrule (2) applies with necessary modifications. (4) If subrule (1) does not apply, the regional senior judge in whose region the proceeding was commenced may, on his or her own initiative and subject to subrules (5) and (6), make an order to transfer the proceeding to another county in the same region. (5) Before making an order under subrule (4), the regional senior judge shall direct the parties to appear before him or her, by personal attendance or under rule 1.08 (telephone and video conference), to consider whether the order should be made. (6) An order under subrule (4) may be made only if the regional senior judge is satisfied that the transfer is desirable in the interest of justice, having regard to the factors listed in subclauses (2) (b) (i) to (ix). (7) If an order has previously been made under subrule (4), a further order may be made, and in that case subrule (4) applies with necessary modifications. (b) all further documents required to be filed in the proceeding shall be filed there. (9) Subrules (1), (2) and (3) apply only to proceedings commenced on or after July 1, 2004. (10) Subrules (4), (5), (6) and (7) apply to proceedings whether they were commenced before, on or after July 1, 2004. (b) it is likely that a fair trial cannot be had at the place named in the statement of claim. (12) Subrules (9), (10) and (11) are revoked on July 1, 2005. (1) A proceeding shall be commenced by the issuing of an originating process. 12. Subrule 14.07 (3) of the Regulation is revoked. 13. Subrule 19.04 (1.1) of the Regulation is revoked. 20.03 (1) On a motion for summary judgment, each party shall serve on every other party to the motion a factum consisting of a concise argument stating the facts and law relied on by the party. (2) The moving party’s factum shall be served at least four days before the hearing. (3) The responding party’s factum shall be served at least two days before the hearing. (4) Each party’s factum shall be filed, with proof of service, in the court office where the motion is to be heard, at least two days before the hearing. 21.03 (1) On a motion under rule 21.01, each party shall serve on every other party to the motion a factum consisting of a concise argument stating the facts and law relied on by the party. 22.02 (1) On a motion under rule 22.01, each party shall serve on every other party to the motion a factum consisting of a concise argument stating the facts and law relied on by the party. 37.03 (1) All motions shall be heard in the county where the proceeding was commenced or to which it has been transferred under rule 13.1.02, unless the court orders otherwise. (2) Subrule (1) applies to a proceeding whether it was commenced before, on or after July 1, 2004. (3) Subrule (2) is revoked on July 1, 2005. (6) A party may serve on every other party a factum consisting of a concise argument stating the facts and law relied on by the party. (7) The moving party’s factum, if any, shall be served at least four days before the hearing. (8) The responding party’s factum, if any, shall be served at least two days before the hearing. (9) Each party’s factum, if any, shall be filed, with proof of service, in the court office where the motion is to be heard, at least two days before the hearing. (c) send a copy of the confirmation of motion to the other party by fax or e-mail. (2) If no confirmation is given, the motion shall not be heard, except by order of the court. (b) send a copy of the corrected confirmation of motion to the other party by fax or e-mail. (1) The applicant shall, in the notice of application, name the place of commencement in accordance with rule 13.1.01, and the application shall be heard there. (2) Subrule 38.03 (1.1) of the Regulation is revoked. (4) If a notice of application has been served and the respondent wishes to make an application against the applicant, or against the applicant and another person, the respondent shall make the application at the same place and time to the same judge, unless the court orders otherwise. 21. Subrule 38.09 (3) of the Regulation is amended by striking out “at least four days before the hearing” and substituting “at least two days before the hearing”. (c) send a copy of the confirmation of application to the other party by fax or e-mail. (2) If no confirmation is given, the application shall not be heard, except by order of the court. (b) send a copy of the corrected confirmation of application to the other party by fax or e-mail. 40.04 (1) On a motion under rule 40.01, each party shall serve on every other party to the motion a factum consisting of a concise argument stating the facts and law relied on by the party. (2) Each party to a motion under subrule (1) shall, unless the motion is made on consent, serve on every other party to the motion a factum consisting of a concise argument stating the facts and law relied on by the party. (3) The moving party’s factum, if any, shall be served at least four days before the hearing. (4) The responding party’s factum, if any, shall be served at least two days before the hearing. (5) Each party’s factum, if any, shall be filed, with proof of service, in the court office where the motion is to be heard, at least two days before the hearing. 46.01 The trial of an action shall be held in the county where the proceeding was commenced or to which it has been transferred under rule 13.1.02, unless the court orders otherwise. (3.1) A notice of renewal of garnishment may be issued under subrule (6.4) without leave of the court before the original notice of garnishment or any subsequent notice of renewal of garnishment expires. (6.2) A notice of garnishment remains in force for six years from the date of its issue and for a further six years from each renewal. (6.3) A notice of garnishment may be renewed before its expiration by filing with the registrar where the proceeding was commenced a requisition for renewal of garnishment (Form 60G.1) together with the affidavit required by subrule (4). 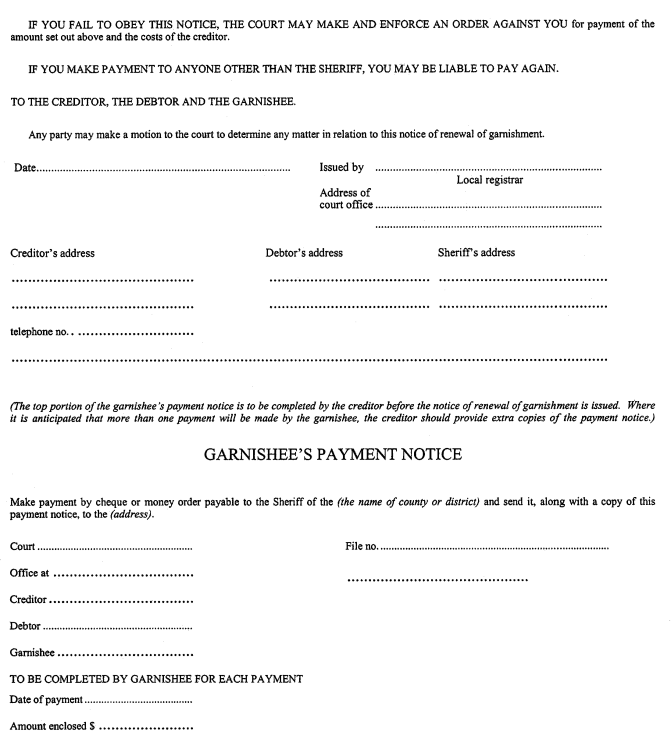 (6.4) On the filing of the requisition and affidavit required by subrule (6.3), the registrar shall issue notices of renewal of garnishment (Form 60H.1) naming as garnishees the persons named in the affidavit and shall send a copy of each notice of renewal of garnishment to the sheriff of the county in which the debtor resides or, if the debtor resides outside Ontario, to the sheriff of the county in which the proceeding was commenced. (6.5) The provisions of these rules that apply with respect to notices of garnishment also apply with respect to notices of renewal of garnishment. 60.15 (1) When a writ has been fully executed or has expired, the sheriff shall so indicate in his or her file, and the writ shall be removed from the active file, transferred to a separate file of executed, expired and withdrawn writs and retained there. (2) When a writ is withdrawn, the sheriff shall record the date and time of the withdrawal, and if the writ is withdrawn as against all the debtors named in it, it shall be removed from the active file, transferred to a separate file of executed, expired and withdrawn writs and retained there. (3) A party or lawyer who has filed a writ with a sheriff may withdraw it as against one or more of the debtors named in it by giving the sheriff written instructions to that effect. (4) A party who has filed a writ with a sheriff may withdraw it as against one or more of the debtors named in it by filing a withdrawal of writ electronically under subrule 4.05.1 (2). (b) a certified copy of the order of discharge. (b) within 30 days after the date of the sheriff’s notice, serves the sheriff with a copy of the notice of motion and a copy of all affidavits and other material served for use on the motion. 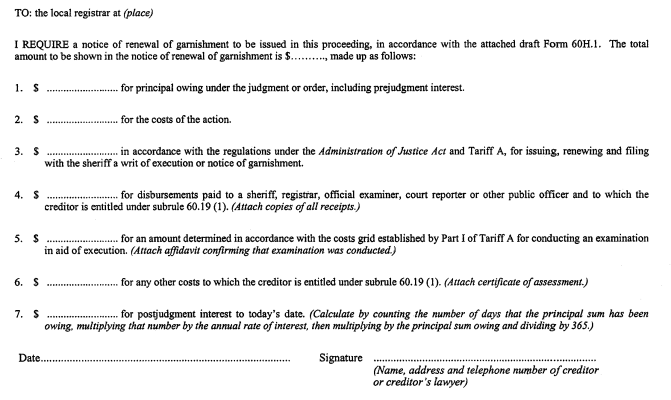 (7) The sheriff shall withdraw the writ after the day that is 30 days after the date of the notice to the creditor, unless the creditor has taken the steps described in clause (6) (b). (8) If the creditor takes the steps described in clause (6) (b), the sheriff shall not withdraw the writ at the debtor’s request unless the court orders otherwise. 28. Rule 61.01 of the Regulation is amended by striking out “clause 62.01 (1) (b), rule 62.02 or rule 71.03” and substituting “clause 62.01 (1) (b) or rule 62.02”. (b) on any person entitled by statute to be heard on the appeal. (b) a respondent who has not delivered a notice of appearance, unless the respondent was heard at the hearing with leave. 32. Subrule 61.07 (1.2) of the Regulation is amended by striking out “before serving the notice of cross-appeal”. 33. (1) Subrule 62.01 (2) of the Regulation is amended by striking out “within seven days after the date of the order or certificate appealed from” and substituting “within seven days after the making of the order or certificate appealed from”. (b) any further material that was before the judge or officer appealed from and is necessary for the hearing of the appeal. 34. (1) Subrule 62.02 (2) of the Regulation is amended by striking out “within seven days after the date of the order from which leave to appeal is sought” and substituting “within seven days after the making of the order from which leave to appeal is sought”. (6) On a motion for leave, each party shall serve on every other party to the motion a factum consisting of a concise argument stating the facts and law relied on by the party. (6.1) The moving party’s factum shall be served at least four days before the hearing. (6.2) The responding party’s factum shall be served at least two days before the hearing. (6.3) Each party’s factum shall be filed, with proof of service, in the court office where the motion is to be heard, at least two days before the hearing. (c) in a county chosen by all the parties, but only with the court’s permission, given in advance in that county. (2) If there is immediate danger that a child may be removed from Ontario or immediate danger to a child’s or party’s health or safety, a party may commence the proceeding in any county and a motion may be heard in that county, but the proceeding shall be transferred to a county referred to in subrule (1) immediately after the motion is heard, unless the court orders otherwise. (d) the lawyer or party asking to file the petition says in writing that the proceeding is one that may be commenced in that county under clause (1) (b) or subrule (2). (4) All steps in the proceeding, other than enforcement, shall take place in the county where the proceeding is commenced or to which it is transferred. 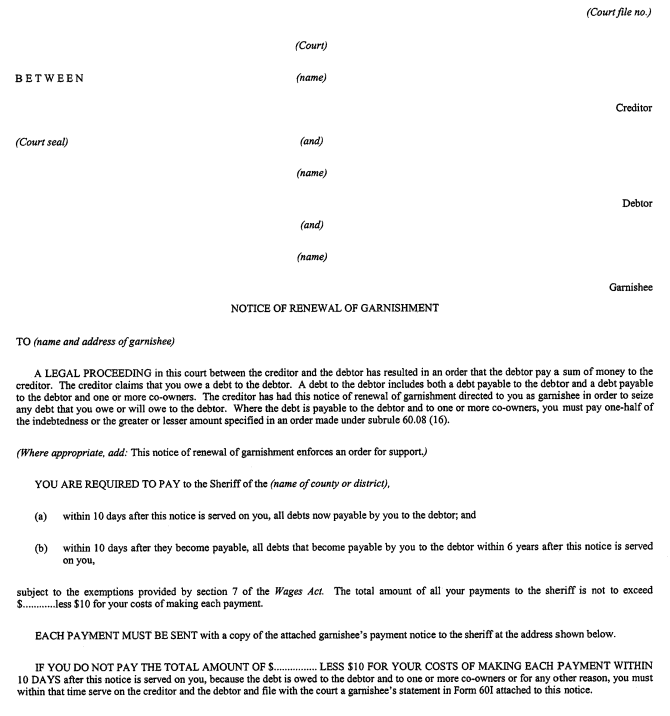 (d) in the case of a motion under section 26 (income source dispute) of the Family Responsibility and Support Arrears Enforcement Act, 1996, in the county where the income source resides. (7) An order, other than an order for payment of money, that is being enforced by a contempt motion may also be enforced in the county in which the order was made. (8) When a step in the enforcement of an order takes place in a county described in subrule (5), (6) or (7), all related documents shall be filed there as well. (9) If it is substantially more convenient to deal with a proceeding or any step in the proceeding in another county, the court may, on motion, order that the proceeding or step be transferred there. 70.05 The place of commencement and of other steps in a proceeding shall be determined in accordance with rule 69.17, which applies with necessary modifications. 37. Subrule 70.10.1 (6) of the Regulation is amended by striking out “subrule 37.03 (2) (place of hearing of motion made on notice)” in the portion before clause (a) and substituting “rule 37.03 (place of hearing of motions)”. 38. Subrule 75.1.14 (5) of the Regulation is revoked. (c) the defendant makes a counterclaim, crossclaim or third party claim that does not comply with subrule (1) and states in the defendant’s pleading that the counterclaim, crossclaim or third party claim is to proceed under the ordinary procedure. (2) Subrule 76.02 (6) of the Regulation is amended by striking out “an amendment to the pleadings” in the portion before clause (a) and substituting “an amendment to the pleadings under Rule 26”. (3) Subclause 76.02 (7) (b) (i) of the Regulation is amended by striking out “amended” and substituting “amended under Rule 26”. (2) Unless the parties agree otherwise or the court orders otherwise, the motion shall be heard in the county where the proceeding was commenced or to which it has been transferred under rule 13.1.02. (5) Unless the court orders otherwise, all motions shall be heard in the county where the proceeding was commenced or to which it has been transferred under rule 13.1.02. 42. (1) Form 11A of the Regulation is amended by striking out “section 69 of the Bankruptcy Act (Canada)” and substituting “section 69.4 of the Bankruptcy and Insolvency Act (Canada)”. (2) Form 14A of the Regulation is amended by striking out “The plaintiff proposes that this action be tried at (place)”. (3) Form 14B of the Regulation is amended by striking out “The plaintiff proposes that this action be tried at (place)”. (4) Form 14D of the Regulation is amended by striking out “The plaintiff proposes that this action be tried at (place)”. 43. (1) Subject to subsection (2), this Regulation comes into force on filing. (2) Subsection 4 (2), sections 10, 11 and 14 to 25, subsections 33 (2) and 34 (2), sections 35, 36, 37, 40 and 41, and subsections 42 (2), (3), (4) and (7) come into force on July 1, 2004.